During demolition of the Arthur Memorial Church the church bell was recovered . The name of the maker and year of manufacture is inscribed at the top of the bell – “SHERIDAN DUBLIN MAKER 1855” . Having been cast in 1855, the bell appears to have been the one used in the original Free Church before being installed in the Arthur Memorial church at the time of it construction. At the heart of the bell is a harp above a garland of shamrocks with the motto “ERIN GO BRACH” … “IRELAND FOREVER”. 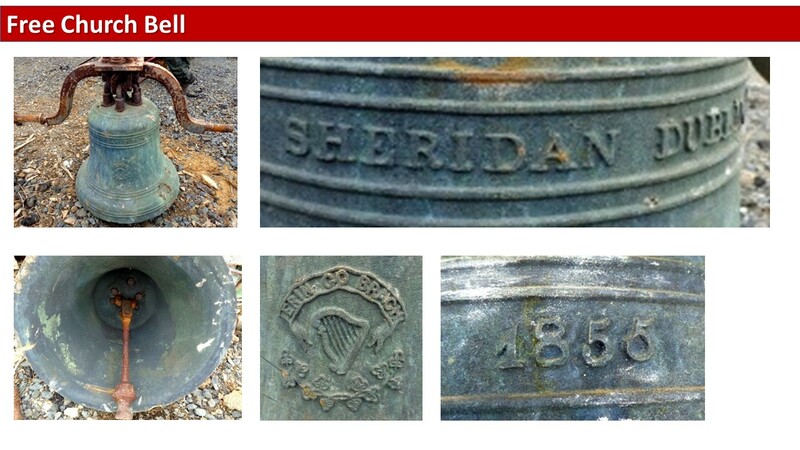 An example of a Sheridan bell and some background to the Dublin foundry can be found in the National Museum of Ireland web-site here . Glenfinnan, Roman Catholic Church of Our Lady anb St. Finnan. The bell is inscribed “THOMAS SHERIDAN & CO EAGLE FOUNDRY DUBLIN 1875″ and “BENEDICITE MONTES ET COLLES MARIE ET FLUMINA DOMINO” (Mountains and hills and rivers, bless the Lord Mary). Both bells are ‘Thomas Sheridan” bells and so perhaps the New Cumnock bell of 1855, is the earliest example of a Sheridan bell in Scotland.